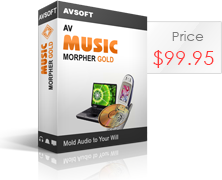 AV Music Morpher Gold 5.0 makes editing audio and doing DJ tasks just a snap. It is packed full of powerful features including a brand new virtual DJ, a new Converter module, a multi-track recorder and editor, a whole suite of professional effects and our famous patented vocal Remover and Extractor. The DJ module helps users do simple DJ tasks such as re-mixing songs, adding sound FX, adjusting channels, EQ or any one of the hundreds of included studio-quality effects. The Converter module helps convert multi-format audio files more quickly and conveniently. AV Music Morpher 5.0 is music gear that is convenient and versatile, yet cost-effective for music lovers. This is a resourceful multi-channel music mixer that enables you to edit any number of channels for surround sounds. It has been improved with a multi-track editor and more cool music effects. The interactive funny space helps you enjoy special collections of funny sounds, ringtones, audio clips, etc. without using any browser. 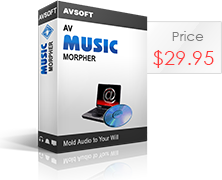 AV MP3 Player Morpher 4.0 is the only MP3 player that can play, change and morph music with complex audio/sound effects. It also records and converts music in 10 different audio formats, including MP3, WAV, WMA, OGG, APE, etc. AV RingtoneMAX is a free ringtone maker which can make new, unique ringtones by mixing voice records, songs, and applying audio effects..
"Music for a party ? You need more than just a CD or MP3 player"